The drink coaster is an instrument of precision, designed to protect perfection. An executive drink coaster has to do more than merely function, it has to impress. Below are several sets of drink coasters that would be appropriate even in the palace of a king. Swirling powerful colors wash across the surface of these attractive executive coasters, giving each piece a distinction, as well as a force of will, that causes them to draw attention from everyone in the room. 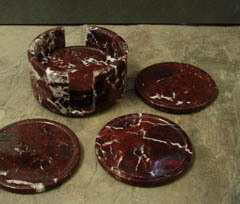 This set consists of six multi colored onyx coasters, each one a one of a kind, matched up with an onyx stone holder, which gently cups the accessories in the palm of its sides. Coasters are supposed to be fubctional. They serve their purpose in the name of perfection, protecting your posessions from drips and scratches. However they arent necessarily supposed to be a centerpiece in an of themselves. Sometimes you just want your coasters to be professional, attractive, and subdued. You want them to melt languidly into the background, elevating the room, but not drawing attention to themselves. Soft tones merge and melt into one another. Like a vision of clouds floating languidly on the sky, the sirface of each coaster is an enchanting jaunt into a world of floating freedom. 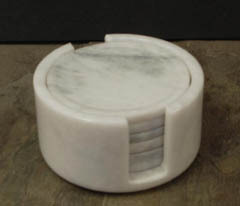 Meanwhile all of this frivolity is captured securely beneath the perfect polished surface of these attractive marble beverage coasters. 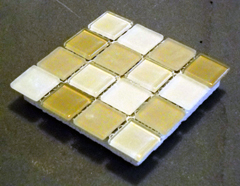 These coasters represent an innovative design, combining the beauty of smooth, translucent, mosaic glass chips, with the functional absorbency found in natural sandstone, to create a set of coasters which are powerful, and yet refined, elegant, and yet forceful, smooth perfection awaiting the touch of a cold glass to its cool liips. 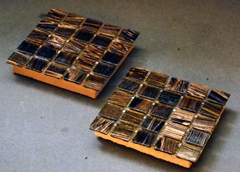 The powerful copper tones that emerge from in surface of these attractive glass coasters gives these pieces a feeling of passion, a tonal contrast that creates a potent energy within the pieces. And yet the smooth perfection of impermeable glass does not come at the expense of function, as the innovative rivulet design allows moisture to slip unnoticed down into the heart of its sandstone base. Dark and brooding, and yet simmering with an unchecked power which belies the smooth elegance of the coasters perfect polished face. 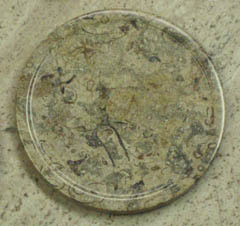 This contrast of dark gray tones, broken by bursts of light, results in a surface pattern which engages the eye, drawing gazes down into the translucent surface of the stone, letting the masterpiece of chaotic form in each chip lead your sight down into the stormy depths of its surface colors. The shining perfection of the glass chips found in the surface of these coasters contrasts with the uplifting demeanor of the colors and tones themselves, combing to create an accessory which spreads a spirit of calm and peace throughout the atmosphere, lending its amicable nature to the very essence of the room they are placed in. Executives require precision, perfection, and pristine surfaces. These coasters are the epitome of those ideals. 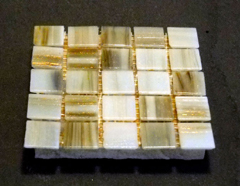 The surface of the piece is smooth polished glass perfection, twenty five squares, each different, interesting, engaging, and yet at the same time engaging to the eye, adding a sense of vigor and expectancy to the nature of the pieces themselves. 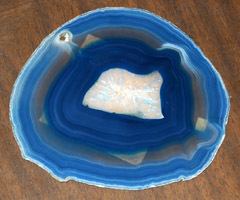 Not only do the fossil stone coasters has that pure precise perfection that comes from highly polished marble, but they also have historical significance. Within the suirface of each piece are the dendritic remains of ancient creatures, plants, micro organisms and shells, all waiting to be percieved by the discerning eye. Hold the past in the palm of your hands. 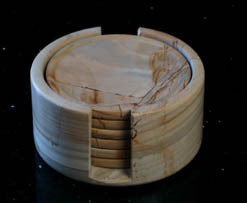 An executive coaster has to be crafted from only the fonest materials. 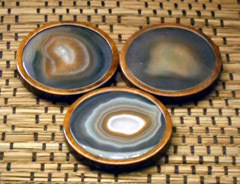 Here we see a set of drink coasters that is made from slices of semi precious natural agate. 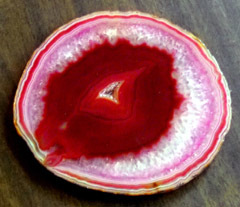 This attractive gemstone is highly prized in the decorative arts, and is often used in jewelry, high end architecture, and artistic mosaic endeavours. Now its polished perfection is available in your home or office. 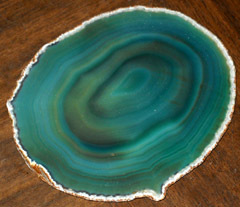 The natural gemstone drink coasters have a kind of dignity. Beneath the perfection of the polished surface, there are an array of colors swirling, merging, colliding into one another. Yet all of this happens behind the viel of the perfect surface, hidden from reality, captured in an eternal moment. 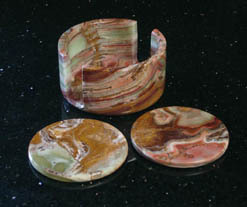 A delightful array of pink tones alights gently on the surface of these perfect polsihed gemstone beverage coasters. 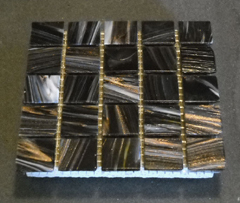 These tones array themselves in alternating bands, which sweep luxuriously across the face of these attractive coasters. perfect for the desk of the most high end executives.